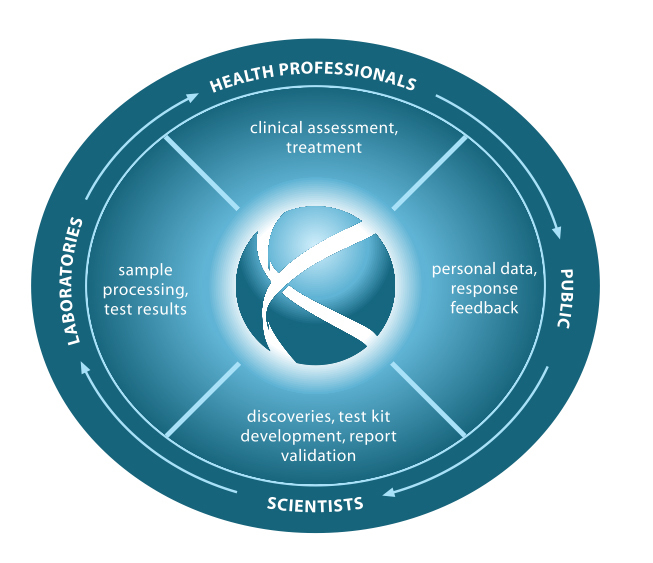 Gknowmix provides an integrated system for genetic testing service delivery involving healthcare practitioners, medical scientists, laboratories and the public. The objective is to identify gene-environment mismatches in an individual – that may be reflected by biochemical abnormalities or differential gene expression – and to use this information to facilitate the prevention of cumulative effects that may lead to disease development or progression. This approach includes the emerging disciplines of pharmacogenetics and nutrigenetics. It is based on the knowledge that a single genetic risk factor is not sufficient for the development or progression / recurrence of complex chronic disorders. Our unique test concept developed as part of an ethically approved translational research project combines the analysis of both high-penetrance genes (diagnostic, risk assessment) and low-penetrance genes (contributing factors, targets for treatment) in the context of the patient’s medical history, clinical indicators, and lifestyle risk factors where appropriate. With the recent development of a comprehensive 3-in-1 test application including whole exome and long-range nanopore sequencing it is now possible to also identify rare variants in genes with moderate penetrance. The genetic test results are provided in a comprehensive report – which not only focuses on disease diagnosis and treatment of symptoms – but also explains where possible how the expression of certain genes are influenced by modifiable environmental factors. A specific genetic test is performed only once in a lifetime. It usually involves laboratory analysis on genetic material extracted from cells obtained from a blood sample or saliva/cheek swab. A tumour, skin or liver biopsy may also be used in some patients for prognostic and drug response testing. 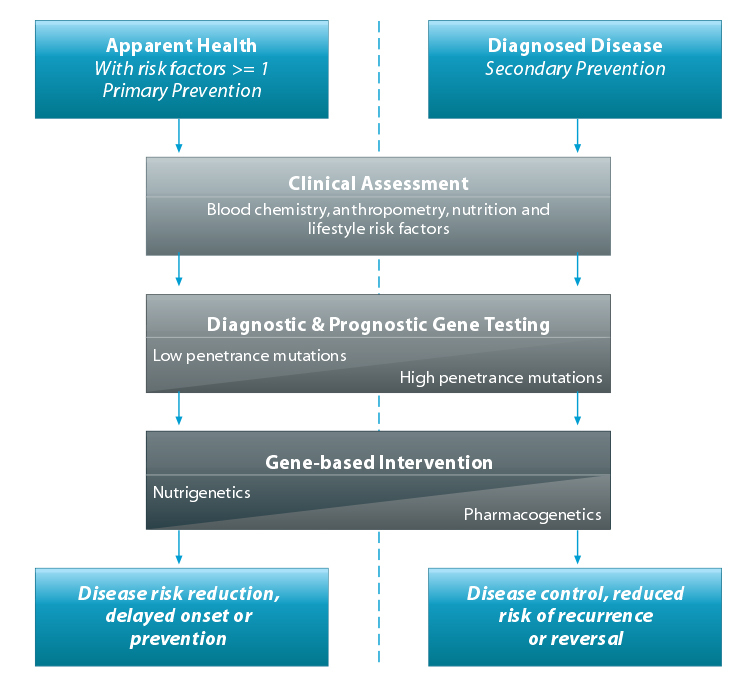 The comprehensive risk management test concept illustrated in the figure may involve testing for both low- and high-penetrance gene mutations and gene expression, depending on the family history and health status of the individual. Information provided to healthcare practitioners in the test reports relates to both gene-drug (pharmacogenetics) and gene-diet (nutrigenetics) interactions where appropriate. The genetic alterations included in risk management tests are involved in key metabolic processes. Some direct transport or uptake of nutrients in the diet, while others play an important role in blood clotting, inflammation, removal of environmental toxins, or response to medication. In contrast to a typical pathology test that measures the effect of a gene product, a molecular genetic test identifies a genetic change even before any symptoms develop or could signal the aggressiveness of a tumour. This enables the potential implementation of preventative measures before the development of clinically significant pathology or treatment targeted at the cause of the disease to reduce recurrence risk. Relevant pathology are measured as a screening step for test selection, to assess phenotypic expression of genes and to monitor response to treatment. Grant KA, Apffelstaedt JP, Wright C, Myburgh E, Pienaar R, de Klerk M, Kotze MJ. MammaPrint Prescreen Algorithm (MPA) reduces chemotherapy in patients with early stage breast cancer. South African Medical Journal 2013; 103(8):522-526. Kotze MJ, van Velden DP, Botha K, Badenhorst CH, Avenant H, van Rensburg SJ, Cronje FJ. Pathology-supported genetic testing directed at shared disease pathways for optimized health in later life. Personalized Medicine 2013; 10 (5): 497-507. Test concept for multi-factorial medical conditions. Risk management genetic testing includes evaluation of the current health status of the individual, documentation of the family history, and pathology supported gene-based intervention based on the overall risk profile.